We’ve a guest post today from Janet Read to coincide with the launching of the amazing quilt that emerged from #107days. I’ve just seen a photograph on Twitter of George Julian taking LB’s Justice Quilt to the Lancaster conference where it will see the light of day in public for the very first time. If you were travelling north by train today and saw someone carrying a very large multi-coloured sausage, it was probably George. This reminded me that I’d better get a move-on with the post I promised Sara I’d write about the making of the quilt. I started it the other day but I was feeling a bit inhibited and it all turned out rather stodgy and boring. And the quilt (and the process of making it) is about as far from stodgy and boring as it’s possible to get. The inhibition came from feeling that it’s hard to write honestly about something I’d had a hand in making, without fretting about looking as if I’m blowing my own trumpet. The thing is, there’s no getting away from the fact that I think the quilt is bloody marvelous and so do the other makers, Janis Firminger, Margaret Taylor and Jean Draper. It ‘s everything we hoped it would be and much, much more besides. It’s given us immense joy every time we’ve worked on it, looked at it and talked about it. We’ve been incredibly moved by it, too. But of course, the whole point is that it wasn’t really down to us at all. The main reason for its magic is that a whole bunch of you people who care about what happened to Connor and who want to change things for other dudes, rose to the occasion and set to. We said that we wanted to make something that reflected the campaign and its mood and energy. Well, you outsider artists sure didn’t need telling twice! The pieces that you sent us to work with were more arresting, inventive, moving, angry, irreverent, colourful, thoughtful, beautiful, affectionate and informed than anything we could have hoped for. They came embroidered, appliqued, crayoned, painted, felt-tipped, crocheted and knitted. They sometimes arrived with apologetic notes saying you hoped they were good enough. Good enough? Yes! Yes! Yes! More than! Every single one! At the beginning, only Janis, Margaret and I were involved. We consulted Sara and George, did the post, asked people to take part and waited. Would anyone respond and if so, how many? We had no idea. We told ourselves that small could be beautiful but to be honest, ‘LB’s Justice Tea towel’ might have felt a bit of an anti-climax. 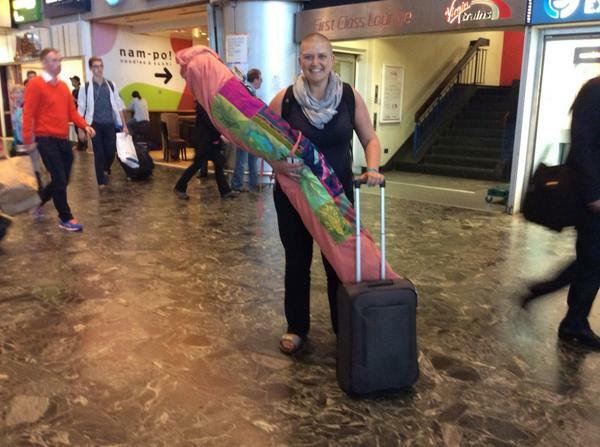 On the other hand, where would Sara keep something the size of a football pitch? Then the contributions started coming in thick and fast– the patches and the gifts of thread and fabrics. I got the best job of opening the post and keeping tabs on what we’d had. It was so exciting. Apart from the individual contributions, we had the workshop at Cardiff Law School which Lucy Series wrote about on 107 days and the Messy Church in Kent organized by Beckie Whelton, also recorded on 107 days. I didn’t know what Messy Church was but I do now. I can tell you it sounds a whole lot more fun than the Sunday School I went to! Shortly into the project, Janis, Marg and I found ourselves needing some help. Confession time now: we three are stitchers but we’d never made a quilt before in our lives! Sorry. I can almost hear a sharp intake of breath from all the proper quilters out there because they know better than most that The Great British Bake Off doesn’t have the monopoly on THE TECHNICAL CHALLENGE. So, we asked for a leg up from my big sister Jean whose day job is art textiles and who knows a thing or two about quilting and all sorts of other stuff involving fabric and thread. She loved the idea of the project and was busy stitching patches. After being bombarded daily with beginners’ quilting questions, she offered to join in. One of the best times (and there were many good ones) was the very first time that we laid out all the patches in the same place. When we stood in front of this vivid mass covering my dining room floor, it took our breath away. We knew quite simply that we had something very special to work with. And that’s about the top and bottom of it really. The end of May was close of play for contributions but of course, they came in for a while after that. What else would we have expected from a load of stitching rule-breakers? The patches came in all shapes and sizes, too, and were probably the better for it -though I did threaten at one stage, to stitch a patch that said’ Social justice activists can’t measure 4X6 inches’. When all the patches were in, we put the rather complicated jigsaw together ,and spent the summer machining, quilting and hand-stitching The People’s Art Work , as we sometimes called it. The final stitch went in a week ago. I don’t know how many patches there are because every time I started counting, I was distracted by something that I’d not looked at properly before. Living with the quilt has been a pleasure, and running our hands and eyes over your lovely work for the past three months has been an unforgettable experience. We’ve handled it nearly every day and that means that scarcely a day has gone by without our thoughts turning to Connor, his family and the other dudes. We’ve talked about them a lot too. We hope that the quilt will have the same effect on other people when they stand in front of it. Someone asked me last week when we were doing another one and the reply was that we’re not. LB’s Justice Quilt is a one-off for Connor, the dudes, Sara and her family. Our heartfelt thanks, then, to all you patch-makers, protest stitchers and outsider artists. It ‘s truly brilliant that you created so many strong and beautiful fragments of resistance in response to something so terrible. What gifts you gave! We couldn’t publish this post without acknowledging ourselves the absolutely phenomenal beauty of the Justice Quilt. There is so much love stitched into the quilt, which somehow perfectly captures the crowdsourced magic of the #107days campaign. The quilt would have certainly been a pile of patches if it wasn’t for the extreme dedication of Janet, Janis, Margaret and Jean, and we will be forever grateful to them for their work. The quilt is officially being ‘launched’ at the #CEDR14 conference today (10 September 2014) and we will be looking for a number of venues to host the quilt over the next year. Given how delicate it is we don’t want it travelling every week so we’ll be looking for venues that can display the quilt, while also protecting it. If you have contacts in venues, organisations, galleries etc then feel free to leave a comment, drop us a tweet @JusticeforLB or send us an email with your suggestion and we’ll collect them in and make a touring plan. We are really keen that as many people get to see the quilt as possible, so we’ll keep you all posted on these plans. Thank you to all our patchers, your contribution to bringing JusticeforLB and all young dudes is stitched into the fabric of this campaign. This entry was tagged 107days, 107days of action, activism, campaign, cedr14, connor sparrowhawk, Janet Read, justice, justice quilt, justiceforLB, justiceforlb quilt, lancaster, learning disability, patchwork, quilt, resistance quilting. Bookmark the permalink. Really moving to see the finished article- a patchwork of support for Sara, Connor and all the young dudes-and so vibrant and creative- it reflects Connor. 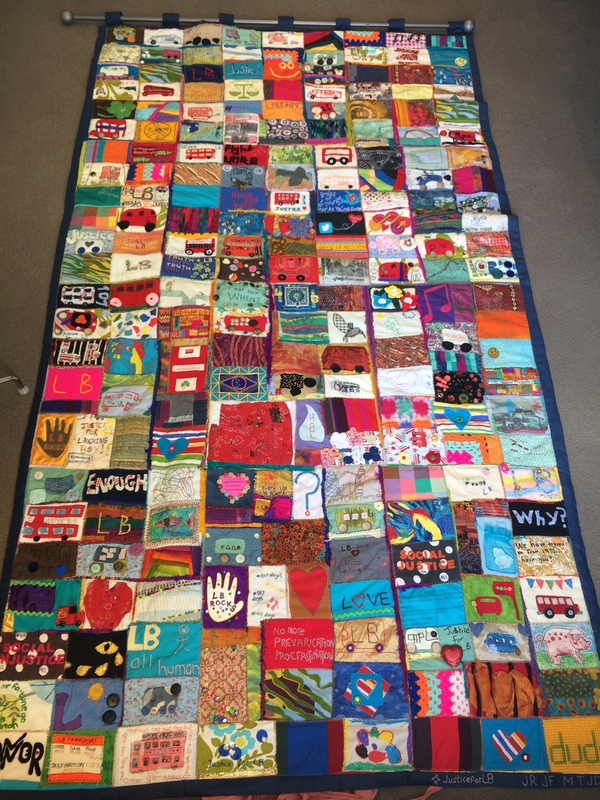 Thank you all for your amazing work in completing this wondrous quilt! It is truly spectacular and unique, conveys love and hope for #justiceforLB. (Just a little proud to be a contributor!). This is just absolutely, astonishingly, beautiful – in every sense of the word. I can’t stop looking at it. It’s so powerful. I had a couple of thoughts – it’s international human rights day on 10th December, are there plans to do anything to display it then? Also, I would absolutely love a print of this quilt – are there plans to make and sell any?